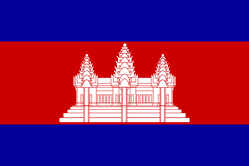 Prominently featured on the flag of Cambodia is a depiction of Angkor Wat, Cambodia's most famous attraction, and the largest Hindu temple complex in the world. This colorful flag is 3' by 5' and printed on lightweight polyester, perfect for indoor display. The flags also have bronze colored grommets for easy hanging.